Most of the year I work on digital topics. But I spend some time each year around the holidays – including this post – thinking about the economics of gift giving. For folks who traffic in ideas, it’s good to be known for something. So I guess I shouldn’t complain about the attention I get from journalists each December for my research on holiday gift giving. But this year I got a lot of attention for advocating giving cash for Christmas, a view I don’t hold. On December 17, the IGM Economic Experts Panel was asked to comment on the statement, “Giving specific presents as holiday gifts is inefficient, because recipients could satisfy their preferences much better with cash.” The panel, reasonably in my view, disagreed with this statement. While the IGM survey did not mention me, economic journalists at prominent outlets took the survey as a referendum on Waldfogel’s view that people should give cash for Christmas (italics added to indicate that this not Waldfogel’s view). 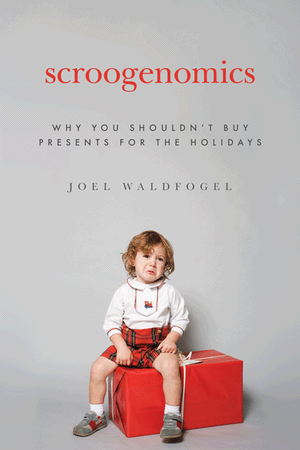 A few years ago Joel Waldfogel wrote “Scroogeonomics: Why You Shouldn’t Buy Presents for the Holidays,” an economic manifesto about the wastefulness of gift-giving. The Initiative on Global Markets at the University of Chicago’s Booth School of Business recently queried its panel of 46 economic experts on the subject, and the responses were surprisingly less Grinch-like. But it turns out Waldfogel’s is not, as they say in economic forecasting, the consensus view on Christmas. Chicago’s Booth School of Business routinely polls leading economists on the issues of the day. This month, it asked whether “giving specific presents as holiday gifts is inefficient, because recipients could satisfy their preferences much better with cash.” Only 17 percent of the economists agreed. Some 54 percent disagreed. The rest weren’t sure. In my view both Rampell and Klein usually produce interesting, high-quality material. But on this topic, I’ve got to say: Hold on there, respected journalists. Sure, I wrote “The Deadweight Loss of Christmas” and Scroogenomics. And I do have qualms about the suitability of other people’s choices for your consumption. But – wait for it – I don’t actually advocate the use of cash as a gift. LUDDEN: So what do you recommend? What is the perfect way to do your holiday gift giving? Mr. WALDFOGEL: Well, although on average gifts generate 20 percent less satisfaction than items we buy for ourselves, it’s also true, though, that different givers create different amounts of missing satisfaction. Folks who know us well or in frequent contact with us, they do pretty well, whereas folks who don’t know us as well, their gifts really miss the mark. So my first suggestion would be for people you know well and for whom you have some good reason to choose a gift, go ahead and keep doing what you’re doing, and it’s especially important to keep giving gifts to kids who would be devastated if they didn’t get them. But for other people, people for whom we are obliged to give gifts but whose preferences we really don’t know, for them we ought to do something different to avoid destroying value. Mr. WALDFOGEL: Exactly. And it’s awkward. It’s really a socially impermissible gift, but something that’s a lot like cash in the sense that it allows the recipient to choose which item he or she will actually consume is a gift card. But I can’t really complain. Rampell and Klein both spelled my name right. Previous PostPrevious Prizes for Teams?